Missed Appointments – Are we Inadvertently Making the Situation Worse? DNA Insight is a specialist training consultancy dedicated to supporting CCGs and GP Practices throughout the UK in the successful implementation of NHS England’s General Practice Forward View. We specialise in training support to CCGs, Health Boards, Federations and Practices in introducing the High Impact Actions of Active Signposting and Care Navigation, Correspondence Management and Workflow Optimisation and Quality Improvement and Leadership. We are also increasingly supporting CCGs, Councils, Community and Voluntary organisations in training Social Prescribers and Link Workers in Enhanced Care Navigation skills. Training for each of the High Impact Actions can be conducted as separate modules or can be combined to deliver a significant enhancement in Practice staff capability, freeing up more time for care. Following training with DNA Insight, typical GP Practices will be able to free up GP Capacity by up to 26%, reduce GP paperwork load by 80% and cut Missed Appointments by over 30%. Our Reception Plus™ Active Signposting program is the UK’s only RCGP Accredited Active Signposting program. 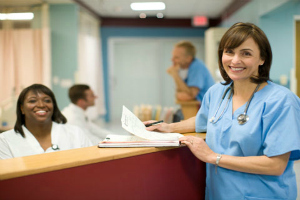 It empowers Reception staff with the techniques and tools needed to move from appointment booker to actively helping patients find the most appropriate healthcare professional for their needs. The non-medical telephone triage techniques are introduced and taught through the medium of half-day, engaging workshops with Reception staff, who become Care Navigators. The Programme can deliver up to 26% reduction in unnecessary GP consultations, greater job satisfaction for Reception staff and happier patients who find it easier and faster to get the help they require. The Coding and Management of Medical Correspondence is one of the Ten High Impact Actions transforming General Practice as part of NHS England’s GP Forward View strategy. It is also often known as Workflow Optimisation. Our CorrespondencePlus™ Programme trains and supports Practice administration staff to read, code and distribute incoming clinical correspondence according to protocols determined by the GP. Typically, up to 80% of the correspondence normally seen by the GP can better be dealt with by another member of the Practice team, thus reducing the amount of unnecessary paperwork placed in front of the doctor. A trained Admin team can free up an average of 45 minutes per GP per day, enabling them to increase the number of patients seen or allocate more time to complex or chronic cases. Social Prescribers or Link Workers work with vulnerable patients or those with chronic conditions on a case management basis. They take a holistic approach to the patient’s health, helping those referred to them by the GP or by MDTs to manage their conditions and ideally move from dependence to independence. RCGP research suggests that Social Prescribing is one of the most effective of the 10 High Impact Actions. It can deliver a 28% reduction in GP appointments, as well as reducing A&E attendances and outpatient referrals. Our SocialPrescribingPlus™ Program is designed for the needs of all Social Prescribers and Link Workers, whether working in GP Practices or throughout Councils and the Third Sector organisations increasingly delivering Social Care. DNA Insight is the only consultancy in the UK specialising exclusively in supporting CCGs and GP Practices to implement NHS England’s GP Forward View strategy. We focus on helping Practices to introduce and successfully implement four of the ten High Impact Actions: Active Signposting, Correspondence Management/Workflow Optimisation, Reducing Missed Appointments and Quality Improvement. Our experienced and accredited consultants draw on evidence-based research from the field of Behavioural Science and techniques from Neuro-Linguistic Programming to identify highly effective techniques that are easy to understand and apply. In the case of reducing Missed Appointments, the addition of just two words by the Receptionist to the normal flow of a telephone booking can reduce missed appointments by 6.4%. By combining several of these powerful techniques missed appointments can be reduced by up to 31%. We recognise that each GP Practice is unique in its staffing structure and in the pressures it faces, both internally and externally. In close collaboration with Practice Managers we therefore customise each of our programmes; ReceptionPlus™ for Active Signposting (non-medical telephone triage), CorrespondencePlus™ for the Management of Medical Correspondence and Social PrescribingPlus™ for Social Prescribers and Link Workers, to the needs of each CCG, Practice or Third Sector organisation. This maximises the chances of success, whilst being sensitive to the stress and pressures faced by staff who are already working to capacity. For an introductory discussion about how we could help you to implement these High Impact Actions, please call us on 0800 978 8323 or complete the Contact Us form at the bottom of the page and we will be pleased to call you back. Would you like to receive our regular Insight articles on the GP Forward View? Insight articles contain what we hope are insightful commentaries on Active Signposting, Care Navigation, Coding of Medical Correspondence, Reducing Missed Appointments and GP Buddies. Thank You. You have successfully subscribed to the DNA Insight Newsletter.